The White Cockroach - is it Really Albino or Something Else? The White Cockroach – is it Really Albino or Something Else? Seeing a white cockroach may stun you and freak you out a little bit. They aren’t incredibly common and opinions on them vary greatly. Dealing with cockroaches isn’t a pleasant thing and it can take quite some time before the situation is fully resolved. Below you will find information about white cockroaches from what they are to how you can get rid of them. What is a white cockroach? A white cockroach is quite simply a molting cockroach. Basically a white cockroach is a nymph as they are sometimes called. Albino cockroaches are a complete myth. All species go through the molting process and are white at one time or another. It may spook you a bit to see a white roach among the others, but the reality is they are just not as mature as the others they are seen with. Why haven’t I seen a white cockroach before? People usually don’t see white cockroaches unless there is a huge infestation, which is why they are thought to be a myth. Cockroaches are at their most weak when they are white and getting ready to molt again. Once the molting process begins they are virtually unprotected until their new exoskeleton hardens. This could take up to several hours. 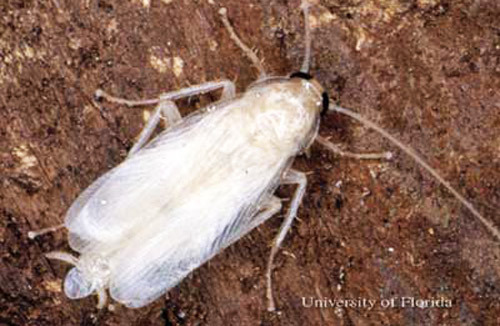 White cockroaches usually hide in order to prevent falling prey to another pest or being killed by the homeowner. What does a white cockroach mean for my roach problem? Unfortunately seeing a white cockroach means you have a pretty big issue regarding population. Black roaches signal they are at the mature level and the white cockroaches are newly hatched, meaning they are breeding in or around your home. It is difficult to determine the species of the roach while it is still white. You will need to wait until it turns either black or brown for identification. If you are seeing these pests, it is time to take care of the issue immediately. The answer to this question is both yes and no. A white cockroach isn’t lethal and it will not bite you. You don’t have to worry about venom or any other fear with these pests. Because a white cockroach will molt, there is potential danger for people with allergies and asthma. Molted exoskeletons can aggravate breathing issues and allergies, especially if they are abundant in the household. Cockroach poop also can have an affect on your respiratory system. If you have family members with these issues, you will need to monitor them closely and possibly remove them from the home until the roach issue is under control. Where will you find white cockroaches? Because these are actual cockroaches, you will find them where you would typically find their mature family members. Below is a list of places to check, especially if you already know there is an issue occurring in your home or on your property. Basements. This is especially true if it is cool and dark in your basement. White cockroaches like to hide when they are molting to be protected and this is the perfect place. Around drains. Because of the damp nature, cockroaches like to hang out around and sometimes even in drains. Behind washers and dryers. Again, roaches like damp and dark places. This spot is ideal for hiding out and going undetected while molting. Cabinets. This is typical of all roaches. Check up at the very top of cabinets because the higher the area, the more appealing it becomes to cockroaches. Crawl spaces. If a place is undisturbed and dark, the roaches will make it their hideout. Be sure to check all the way through the crawl space because sometimes these pests make themselves nearly invisible. Near areas were soil is abundant. Because the white cockroach is newly hatched, they tend to be more prominent near the areas where they were born. Barns and sheds. Outdoor buildings need to be addressed too. Check them thoroughly because if they are also in these places, they will need to be treated when you treat your home. The sad reality is that once you notice a white cockroach in your home, there is likely a big infestation brewing if there isn’t one already in progress. These pests indicate they are almost at sexual maturity and once that happens, you are going to have a serious problem on your hand because they will be breeding. You will need to address the issue immediately to prevent further complications and damage to your home. Below you will find information on how to get rid of white cockroaches. Find their hiding places. Look at all of the places listed above and then check the rest of your home top to bottom. Once you find where the white cockroaches are hiding, you will be able to fight the problem head on. Regular pest control. You can use sticky traps to try and get an idea of the size of the infestation. Once that is done, you can spray insecticide in the areas you know to be inhabited by white cockroaches. Remember to check your outdoor buildings and take care of them as well. Setting sticky traps in there will be helpful as well. Be sure to check the labels about the possible effects on children and pets if you have either in your home. Sanitize. After you are completely sure the roach problem is handled, you will need to clean your house from top to bottom. Many people don’t know this but cockroaches can cause serious health issues between the molted exoskeletons and the poop they leave behind. You will need to use bleach or another equivalent sanitizer to ensure the house is completely free of any possible harm. It is recommended to look into having someone professionally clean your home, but it isn’t necessary if you can manage it on your own. Extermination. If you can’t get rid of these cockroaches on your own, a professional should be called. Do not hesitate to call around to several places to get quotes. Sometimes companies will offer you better rates than the competition, especially if you mention you have been shopping around. If you have enough money to go this route in the first place, you should definitely use an exterminator over doing any part of it yourself. Getting rid of cockroaches is not easy and it is also very time consuming. You may be wondering how to prevent another infestation from roaches. A white cockroach is just a nymph, but seeing them is cause for alarm. It is a sign that your roach problems are about to get bigger than you likely expect. Below are some tips on what to do and use for roach prevention. De-clutter your home. Cockroaches love a clutter-filled home, especially if it contains papers or food. More places to hide means more places to lay eggs and molt without being noticed. These pests reproduce rapidly and one or two roaches can quickly turn into 100 or more. Remove all the garbage and things you are holding on to just to have them. Once the clutter is gone, the chance of re-infestation lowers drastically. Remove the food source. After meals make sure you clean up your kitchen. Sweep up any food that may have fallen onto the floor. Avoid leaving anything out on the counter. Everything should be sealed in containers or plastic bags. Keep your pantry clean and free of any loose food. If you have pets, keep their food up off the floor too. Cockroaches will feed on anything you leave behind. The less food available, the quickly these pests will die off and stay away completely. Seal cracks and entryways in and around your home. Cockroaches can get into your home numerous ways, but holes in screens or torn apart weatherstripping can aide them in the process. Fix your home issues to avoid an re-entrance by the roaches. Spray insecticide around your home. Use insecticide to spray the base of your foundation. Continue spraying around the doors and windows in your home. You can also do this in your cabinets if necessary. Make sure your outdoor buildings like barns or sheds are also included in this process. Read the directions carefully and take extra caution if you have small children and pets in your home. Seeing a white cockroach may alarm you, especially if you haven’t ever seen one in your home before. Remembering they aren’t dangerous is a good place to start. You will need to address the issue, especially if you have seen more than one, or several on different occasions. Because a white cockroach signals the nearing of maturity, your roach issue could easily multiply if ignored. Keep up on the prevention tips and make sure you are actively checking hiding places and any outdoor buildings you have. White cockroaches aren’t something to be afraid of, but they signal a problem you don’t want to have if you can avoid it.